Cat at Heart by Tanya: Trending: On The Dot. Dolce & Gabbana Polka-dot High Waisted Bikini Briefs (buy here) I wished that I could feature the bikini top for these bottoms but they appear to have been sold out. I find high waisted bikini bottoms to be extremely flattering and these are no exception. The print won't go out of style so it gives good reason for splurging on such an expensive item! ASOS Pack of Two Spot Stripe Cube Hair Elastics (buy here) Raise your hand if you wore these as a kid! I know I did and they ranged from hello kitty patterned to stars and rainbows. Who says that we can't still rock these as we mature. I find them as a great accessory for the days when you want to spice up a good old ponytail. Nail Rock White Dots on Red Designer Nail Wrap (buy here) I feel like nail wraps have been the new sensation. Who is bothered waiting for the nail drying process when you can just stick some on, especially when they come in such cute patterns? Valentino Lace and Ruffled Silk-Organza Gown (buy here) My Year 12 formal is coming up next year and I know it's kind of early but I wouldn't mind having this gown.... Just kidding. The price tag of this dress makes me want to become a law student but a girl can dream. Valentino gowns are just spectacular and they are just everything I want in a dress. The delicate spotted lace bodice compliment the voluminous skirt very nicely and I do love the signature red. Mimco Fabric Flower Alice Headband (buy here) Mimco and Alannah Hill makes the best hair accessories. This one is just spectacular and is reduced to a stunning $15 so that's definitely a bargain. The beautiful silk rosette flowers made from polka dot printed fabric topped with a pearl centre is the perfect headband for everyone! Superga House of Holland Collaboration Black & White Dotted Flatforms (buy here) These are definitely a must have and they're on sale so I would recommend you all to grab a pair as soon as possible. The sneaker is simple and can match almost any outfit but with the added polka dot flatform, they make you look like an edgy fashionista. I'm so in love with them!! Kate Spade Designer Cosmetic Bag "Le Pavillion Small Henrietta" (buy here) Even though I can not purchase this product as it doesn't offer international shipping (wink wink nudge nudge), I had to incorporate this as I think it is the cutest makeup bag for everyday use. This small sizing is roomy enough for you to pack only the essentials and it just looks stunning. Topshop Smokey Eyes Quad in Tawny (buy here) Michelle Phan recently did a blogpost about being intrigued to items with cute packaging and I guess I suffer from the same disease. I have never owned this quad so I can't comment on the quality of the eyeshadows but the packaging is just so adorable that I just can't resist! Happy Socks Big Dot Socks in Black (buy here) I always feel like its necessary to include a pair of socks into my collages. They are just the perfect accessory and even though sometimes they are hidden underneath my jeans, it's just a great feeling to know that i'm wearing cute socks. Pop It. Lock It. 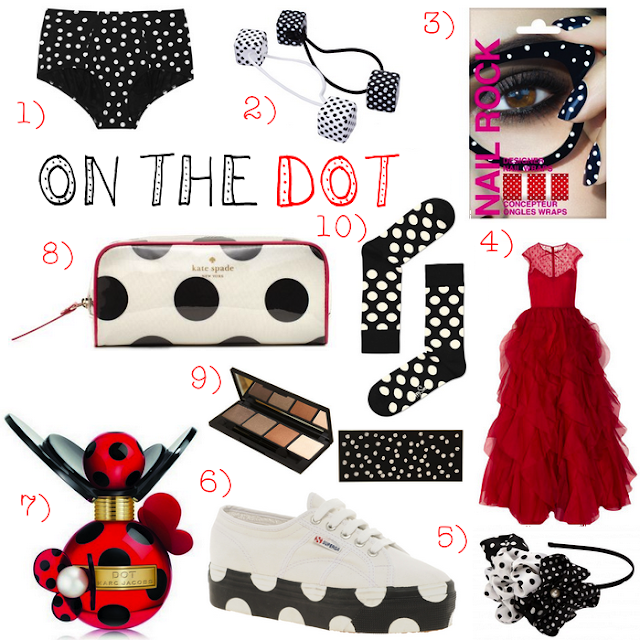 Polka Dot It. I advise that we all follow the instructions of Miley Cyrus and polka dot it. That girl knows what she's talking about and we should all incorporate more polka dot into our closet! I'm in love with your blog! I am obsessed with cats haha :) and polka dots come to mention it! The flatforms are so cool! Oooh I love this! Follow each other ?? I'm just about to go through your old posts! Would love it if we could follow each other? Woww! Great collection of polka dots. Polka dots on shoes is a rare one. i like polka dots too. they just add some attitude to an outfit. Wow that red dress just is amazing!